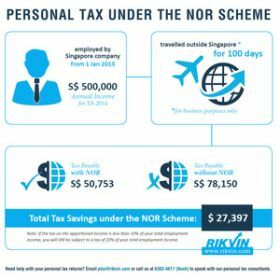 In this page, you will learn about personal income tax rates for non-residents in Singapore. In addition, you will gain an insight into the various tax concessions available under the Not Ordinarily Resident (NOR) Scheme and the Area Representative Scheme. Applicable if you derive a minimum annual income of S$160,000 from Singapore employment in the preceding year. 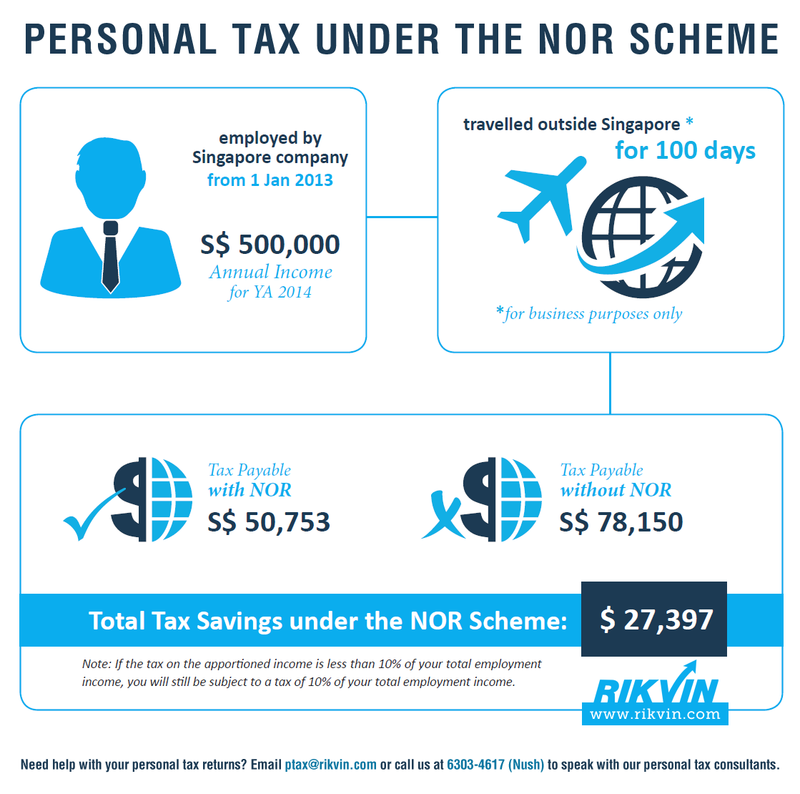 The employer’s contribution to non mandatory overseas pension funds or social security schemes for non-citizens/ non-permanent residents of Singapore is tax exempt subject to NOR cap computed based on the contribution made by employer to the CPF for a Singapore citizen as required under the CPF Act and the employer does not claim deduction for the contribution. The IRAS routinely questions whether the duties performed inside and outside Singapore are genuinely separated and whether there are commercial and economic justifications for dual employment contracts. Therefore, these and other points would have to be considered in assessing whether separate employments would be justifiable. It is expected that most people who have a bona fide reason for a split contract should qualify under The Not Ordinarily Resident Scheme (see below). For this reason, it is anticipated that the IRAS will closely scrutinise dual contract arrangements implemented after the introduction of the Not Ordinarily Resident Scheme in the Year of Assessment 2003. Disclaimer: The information contained in this website is for general reference only. While all reasonable care has been taken in the preparation of this information, Rikvin cannot accept any liability for any action taken as a result of reading its contents without further consulting us with regard to all relevant factors. Need help filing your personal taxes online? Let us do the work for you. With Rikvin, personal tax filing is done right and well before the deadline.